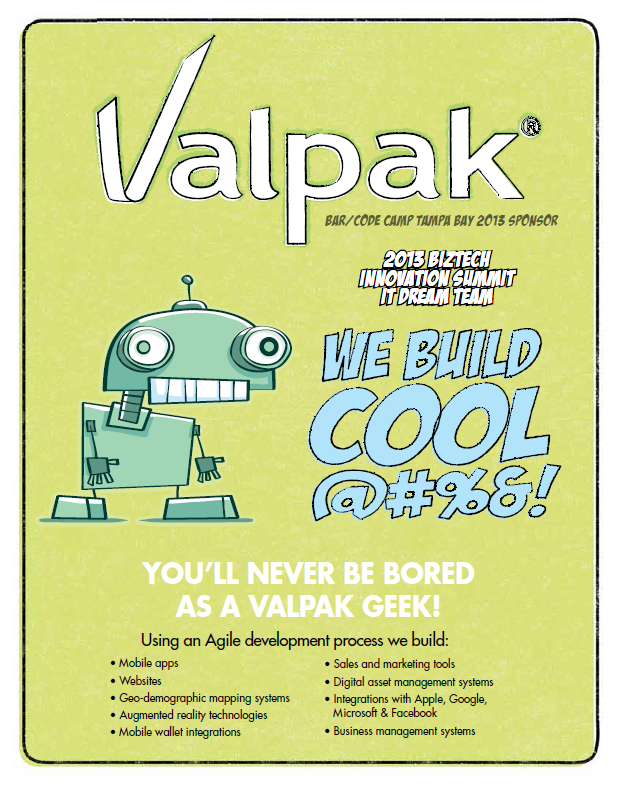 Valpak To Sponsor 2013 BarCamp / CodeCamp … See You There! Valpak is thrilled to be sponsoring BarCamp / CodeCamp Tampa Bay again this year. For those of you that have been living in a cave, BarCamp / CodeCamp is probably the largest FREE (yes, I said FREE) technology event in the area, bringing out almost 1,000 people to the USF College of Business. BarCamp is a one-day unconference with topics and presenters for just about any technology and internet interest. CodeCamp is a one-day meeting forum that allows software developers to share their knowledge and experience with Microsoft products and services. Valpak is sponsoring a room and the best meal of the day … breakfast! When you grab a donut, be sure to look for some of us Valpak-ers lingering about and say “hi” and take a flyer. 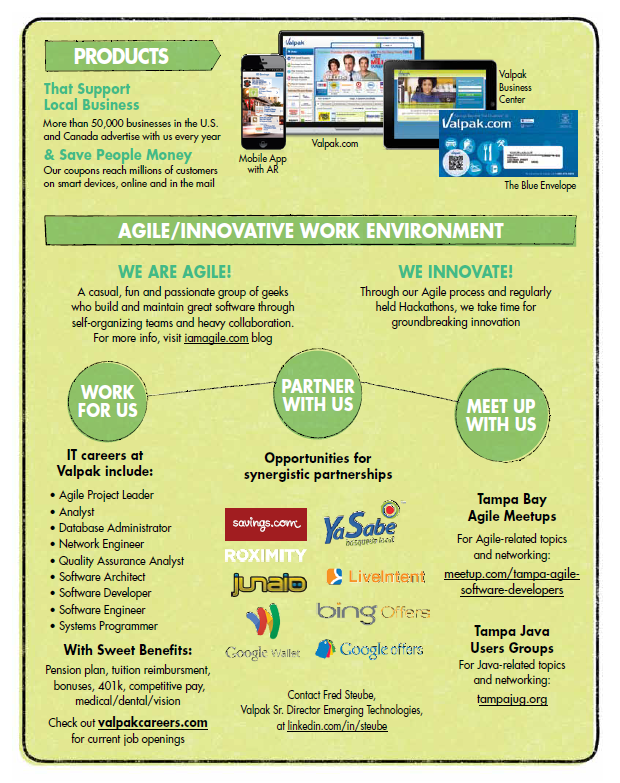 We created a flyer (pictured below) that tells you a little more about us. And yes, that is a robot with an overbite. Come out and join us to learn, network, or even share your experiences by presenting on a topic that interests you. I would love to see more Agile-focused topics this year! Also, our CIO, Chris Cate, will be giving his talk “I Bought A Startup! The Story of Cox Target Media’s Acquisition of Savings.com” as well. You can register for BarCamp / CodeCamp at https://barcamptampa.launchtrack.com/register/camp-2013 . Be sure to register in advance, so you’ll get your meals, snacks, and a free T-shirt!